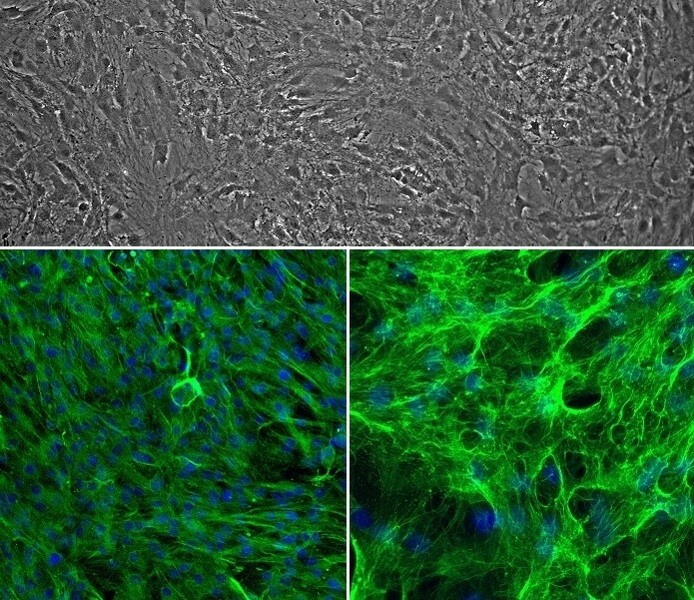 Rat Perineurial Fibroblasts (RPF) from Cell Applications, Inc. are of mesenchymal origin and form the perineurium, one of the three connective tissue compartments of the peripheral nerve. The perineurium wraps around nerve fascicles to form a metabolically active diffusion barrier. It provides protection to the nerve bundles, maintains the homeostasis of the endoneurium, modulates external stretching forces that exerts to the nerve, and regulates endoneurial pressures. RPF and other cells of mesenchymal origin express the cytoplasmic protein Vimentin, a Type III intermediate filament that forms part of the cytoskeleton. By helping to maintain cell shape, cytoplasmic integrity and cytoskeletal interactions, Vimentin functions in cell adhesion, migration and signaling. Perineurial fibroblasts also express fibronectin, a multifunctional extracellular matrix glycoprotein. Like vimentin, fibronectin plays major roles in cell morphology, cytoskeletal organization, adhesion, growth and migration. Fibronectin, which binds other ECM molecules, also functions in cell differentiation, embryonic development, hemostasis, phagocytosis, wound healing and repair. (Click to Enlarge) Rat Perineurial Fibroblasts (RPF) revived (top) and stained for Vimentin (green, bottom left), Fibronectin (green, bottom right), and DAPI (blue).